Request a quote for a bulk order for SMAD3S423/425p polyclonal antibody - Classic. Please fill out the form here below. Your local sales account manager will get in touch with you shortly and send you a quotation based on your requirements. Polyclonal antibody raised in rabbit against SMAD3 (SMAD Family Member 3) phosphorylated at Ser423 and Ser425, using a KLH conjugated synthetic peptide. Lysates from different cells treated with TGFb (+) or untreated control cells (-) were analysed by Western blot using the Diagenode antibody against SMAD3S423/425p (cat. No. C15410327) diluted 1:2,000. The position of the phosphorylated SMAD3 is indicated on the right. Figure 1 clearly shows the antibody recognizes the phopsphorylated SMAD3 whereas it has no reactivity towards the unphosphorylated SMAD3. Formalin fixed paraffin embedded epidermal keratinocytes were stained with the Diagenode antibody against SMAD3S423/425p (cat. No. C15410327) diluted 1:400, followed by a peroxidise labelled anti-rabbit antibody. 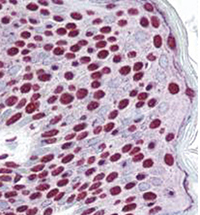 Figure 2 shows nuclear staining of SMAD3 (red). osteogenesis and wound healing. It is also thought to play a role in carcinogenesis. Diagenode strongly recommends using this:	SMAD3S423/425p polyclonal antibody - Classic (Diagenode Cat# C15410327 Lot# 001). Click here to copy to clipboard.